Without The U.S. Government, The World Unites To Fight Climate Change At One Planet Summit : 13.7: Cosmos And Culture The One Planet Summit went on without President Trump Tuesday. But state and local leaders in attendance renewed calls for adherence to the Paris Agreement targets, says blogger Marcelo Gleiser. France's President Emmanuel Macron, center, Arnold Schwarzenegger, left, and Prime Minister of Belgium Charles Michel, right, pose for a photo in front of the Eiffel Tower while aboard a boat cruising on the Seine River after the One Planet Summit, Paris, Tuesday, Dec. 12. A central goal set by the Paris Agreement was to keep global temperatures during this century from rising more than 3.6 degrees F (2.0 degrees C) above pre-industrial times — with an eye on aiming to keep the rise even lower — to 1.5 degrees C. Another was to review each country's contribution to cutting emissions every five years to make sure they keep up with the challenge. To attain this, rich countries are supposed to contribute $100 billion a year by 2020, so that poor nations can cope with climate change. In August, the Trump administration pulled out of the agreement, claiming it to be a bad deal for America. The world responded quickly, sending the current U.S. administration a clear message that its global leadership is at stake. 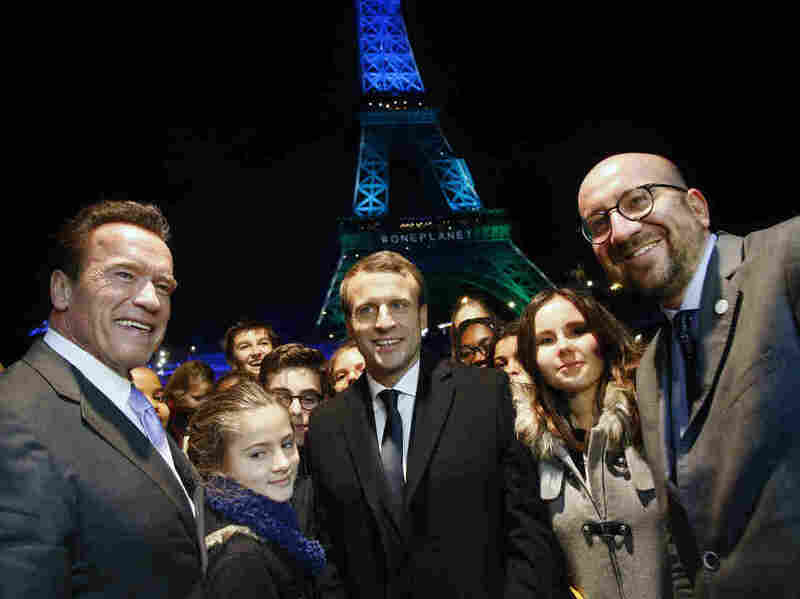 Responding to the leadership void, France's president Emmanuel Macron quickly took action, organizing the One Planet Summit Tuesday in Paris in partnership with the World Bank and the United Nations. Fifty world leaders were invited. President Trump was not. "Make Our Planet Great Again" is the meeting's slogan. "I think the withdrawal — to be totally fair with you — created a huge momentum to me to create a counter-momentum," Macron said in an interview Monday with CBS's Jeff Glor. "There is a clear moral imperative for developed economies such as the UK to help those around the world who stand to lose most from the consequences of man-made climate change. But by putting the UK at the forefront of efforts to cut carbon emissions and develop clean energy, we can also make the most of new economic opportunities. And by taking action to create a secure natural environment, we are fulfilling a duty we owe to the next generation." The One Planet Summit aims to mobilize not just political leaders but also public and private financing to fund a transition to a world where fossil fuels play a decreasing role. At the summit, the World Bank Group announced that as of 2019 it will no longer finance upstream oil and gas. (Unless under exceptional circumstances for the poorest nations that have an immediate benefit.) President Jim Yong Kim also announced that the World Bank is on target to direct 28 percent of its funding to climate action by 2020. Meanwhile, former New York City Mayor Michael Bloomberg said Trump's decision was a "rallying cry" for U.S. cities and companies to move forward on their own to ensure the U.S. met its original carbon reduction targets as set up in the Paris Agreement. "It doesn't matter that Donald Trump backed out of the Paris Agreement, because the private sector didn't drop out, the public sector didn't drop out, universities didn't drop out, no one dropped out." Fortunately, influential world and business leaders have their eyes wide open to what's at stake. Unfortunately, for the time being, this leadership is not coming from Washington.